Sinisi, Fabrizio. 2017. Royal Imagery on Kushan Coins: Local Tradition and Arsacid Influences. Journal of the Economic and Social History of the Orient 60(6). 818–927. This article deals with the development of Kushan royal imagery as known from coins in the period between the 1st and the 3rd centuries AD, i.e. 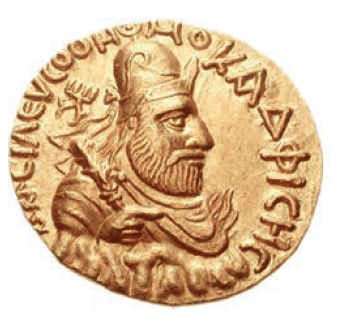 from the so-called Heraios series to the coins of Vasudeva. The aim is to challenge the traditional interpretative models which ascribed a crucial role to a Roman contribution, and to highlight instead first the role of the local numismatic tradition, which stretched back to the Graeco-Bactrians, and then the influx of patterns of royal imagery of western Iranian—namely Arsacid Parthian—origin, around the time when Vima Kadphises inaugurated a new imperial coinage. Fabrizio Sinisi is a scholar of Iranian and numismatic studies at the Austrian Academy of Sciences (ÖAW), Vienna.